kandeej.com: my new no make-up and hair look! just so much love....me and my new little princess (you can read more on my personal bloggy: www.kandeeland.com)...we danced to Jack Johnson...cuddled, snuzzled...and even though I felt exhausted beyond belief....I just wanted to stay away and look at her. Congratulations. I had my first child (Zoe)in September and I'm still filled with Awe. Your beautiful inside and out no matter what Kandee! Heck, if i was you, i wouldn't ever have to wear make up, your gorgeous without it!! So is little cupcake! Congrats Kandee your newest cupcake is beautiful!!! congratulations once again kandee! your cupcake is finally here! Congrats! I love you kandee!! I'm so happy for your family that Cupcake has arrived!! I'm looking forward to hearing about your experience with the home birth! omgg so beautiful(: hope all is well im so happy for you!! I completely agree with you Kandee. and you look just as beautiful without make-up!! you have an amazing heart and it shows through and through!! Being a mother is a wonderful gift!! You are so beautiful inside and out!! Who cares about the makeup and the hair, right?!! As long as we are there for our babies!! Your just as pretty without makeup anyway. I can't wait until my Linguine is born so I can have those same feelings of absolute joy! Here's wishing you lots of love and long naps!! She is so beautiful and amazing. You have inspired me so much Kandee i actually started my very first blog today!!! And truly it is because of you and your inspiration, i know you will probably never have time with all your kiddos but if you ever want to! http://loveconquersall89.blogspot.com/. Congrats to you and Bobby and your beautiful baby girl. I cant wait to someday be so lucky! You are beautiful inside and out. Thank you so much for your work. 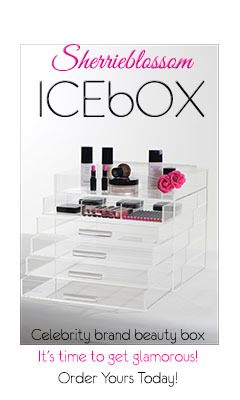 We all love you so much and thank you for being our beauty inspiration! I'll leave you two to cuddle and keep on lovin' hahaha! you and KupKake are gorgeous!! Bobby is one lucky guy! <3 May God continue showering all of you with blessings, you, your amazing family, and the glam sister family we have here with you. I don't know where you find the time to blog Kandee. God bless you and your family! Congratulations she is beautiful just like her mama! What i can see in your face is.. HAPPINESS and LOVE!! You two are so beautiful!! Cupcake kisses to your beautiful babies! Congrats girl! You have natural beauty! Celeb news, fashion, & beauty. You look fantastic, Kandee. Congratulations!!! You are simply beautiful and definetely an inspiration on your total. Your words are inspiring. I wish all women could have a wonderful homebirth as you did. Love you and your baby girl. Tell us about the labor.....how it was? So many many congratulations for your new baby (and yay! that you had her at home) What a beautiful jewel of a pearl of a peachflower. much love to you all. Sometimes I really miss the days when my two were that little. I'm sure you will enjoy every single moment with your new little angel. Congrats Kandee and all the best for you, your son and your new addition. Hi Kandee! I am a new fan of yours! !, well BIG fan I discovered your "Chola" video off of someones facebok wall and just kept on watchin more of tutorials and i LOVE them! absoultely love them. You have an outstanding personality and your great to watch! deffently entertaining!! Ive picked up soo many good tips from you! keep up the great work! and Congrats on your new blessing! I send you all my love dear Kandee! You are the best <3 may god bless you and your sweet family. Hope you have a wonderful night and beautiful dreams. Huge Love, and take special care of your "little people"! 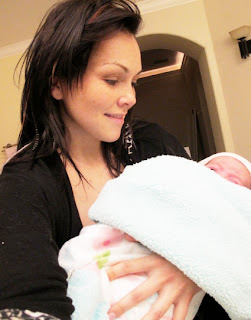 Kandee you are so lucky and you are such an amazing mom. You and your babies ate so blessed to have each other. I hope to be as happy as you are someday. you look gorgeous without makeup.. I love this picture of you two!!! You are so awesome! Baby is so cute and cant wait what her name is gonna be!!! :) something that fits her personality! <3 bye kandee! This picture is so precious! :) You look gorgeous! You're an awesome mama!! All your babies are so lucky to have you as a mama! This might just be the sweetest post I've read from you! So beautiful!!! Congrats on your new baby girl! - Orh, you're so full of love. You make me cry.. It's so beautiful. You are really pretty even without makeup. You look like such a doting new mom. I'm happy for you. you look beautiful with out any makeup. God bless you and your family. Wish all the best for you! Congratulations! i wish you and your little family a life time filled with love, wealth, money, protection, peace & health! Take a good rest and we want to hear more about you. Kandee you look so beautiful with and most definitely without make up! You look amazing, even without any make up. You're a beautiful person and nothing you could do to your outer appearance would taint that. Wow I can't believe you're blogging so soon after having baby! She's adorable, absolutely precious and I'm happy you both are happy and healthy. Congratulations on your newest addition! You're so blessed to have so many beautiful and healthy children. God bless. i felt shivers when i read what you wrote!!! Congratulations Kandee and Bobby she is absolutely adorable. You are such and inspiration to us all. I wish you all the happiness in the world. What a beautiful soul you are!!! Such an inspiration to us all. We need more people like you in the world!!! Congrantz Awwwwww godblesss her shes so cute i wish you both and the new born the best and many more to come luv ur videos again godblesss. I stumbled across your Jem tutorial on Saturday and the next vid was your "6 days past due date". I have watched quite a few now and read quite a few of your blogs, and in such a short space I've gained so much information about a whole family, that I never knew existed. As somebody who gave birth to a little boy shortly after their 19th birthday, you are a TRUE inspiration. I can only hope that by reading your story, I will gain some drive to be a great business woman, friend, sister, lover and mother like you. God bless you and your family and Congratulations on your new addition. You look gorgeous without makeup! You are a beautiful woman and your new baby is amazing. What will be her name??!!!! I'm so excited for you! Kandee, I just made some butterfly cupcakes and wish I could send you some. lots of love and cupcakes! as usual your words are nothing but inspirational. YaYYYY TEAM CUPCAKE!!!!!! She's just perfect with frosting and sprinkles! Love you kandee, have fun with baby's names! I have always liked the name, Sailey. (Say-lee) I just think it sounds girly, and original! May God bless you and your home! You look so georgeous without makeup Kandee!!! I am so happy you and baby are safe, i was really worried about you. I have worked with a lot of babies in the N.I.C.U. and have seen a lot of bad things, I am so happy you and baby are healthy! Yaayy! So happy for you and Bobby! Glad that your little "cupcake" is here, and healthy. Congrats to all of you as your family grows. We are so thrilled to have you in our lives everyday. Your precious bundle is beautiful! Much love from NC ..
Congrats again to you and Bobby! Congrats Kandee..and u look gorgeous.. So sweet!! I bet there is nothing like being a mommy. Your children are blessed with a good one. your beautiful inside and out, Kandee! cupcake is so lucky to have a mama like you! Congrats she is adorable!! My son is four and I can't even believe time has flew by this fast...good luck on your new adventure being a mommy!! I am so happy for you all,well done Kandee. I too found out I am expected another girl today (1boy and 1 girl already) so am so excited. I will miss your pregnancy blogs and videos,but hope you keep us all up too date.